Before any business can take place at meetings, whether it be the local borough or a committee at work, a certain number of members need to be in attendance. This is called reaching quorum. It turns out, the same thing also happens on a microscopic level. For instance, bacteria exhibit a behavior called quorum sensing. In other words, the bacteria have reached a quorum. Other examples of quorum sensing in living beings include how honey bees select locations for new hives or bioluminescence in deep-sea squid. Now imagine that type of behavior in machines. That’s what Dr. Balazs and collaborator Henry Shum, PhD, at the University of Waterloo in Canada have been researching. The duo has mimicked quorum sensing behavior in synthetic — nonliving — materials, which could lead to mechanical devices with the ability for self-recognition and self-regulation. Their research was recently published in the Proceedings of the National Academy of Sciences. Dr. Balazs studies statistical, mechanical and computer modeling of complex chemical systems. The findings build off of a previous study the pair published in 2015, where three microscopic synthetic capsules reacted and moved toward each other using chemical signaling. “They have a bioinspired behavior that enables them to come together and form small groups,” Dr. Shum said. This most recent study, however, modeled a large number of microcapsules and found that, once quorum was met, synthetic particles reacted autonomously to produce distinct oscillations in chemical signals. The oscillations indicate to the other particles that there is a quorum. 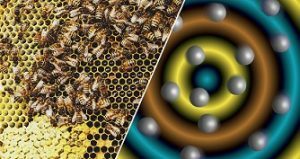 “I don’t want to say the particles are self-aware, but they can perform this simple, elementary lifelike function,” Dr. Balazs said. Dr. Balazs added that these particles’ ability to “count” shows potential blurred lines between what is living and nonliving. Drs. Balazs and Shum said their findings could lead to advancements in soft robotics, a sub-field dealing with the construction of robots from highly flexible materials, similar to those found in living organisms. Their findings could also inspire new “mechano-responsive” materials, such as polymer gels with embedded quorum sensing elements that would activate a certain chemical behavior when compressed, and then switch off when stretched or when a specific temperature is reached. For example: “You could have a robotic skin that solidifies to protect itself at a certain temperature, and then becomes ‘squishy’ again when the temperature drops to a nominal level,” Dr. Balazs said. In the future, Drs. Balazs and Shum will combine aspects of their work by studying how larger microscopic systems react and move toward each other to build different structures. Illustration: Bees use a process called quorum sensing to decide upon a location for a new hive when their population reaches a specific number. On the microscopic level, particles can also sense a quorum through chemical signals sent to other members of the colony. University of Pittsburgh.